National trends show positive job growth, and the job picture is improving in Idaho as well. But construction employment continues to lag. In 2012 Idaho’s construction employment was just 34 jobs higher than 2011 – and that was the annual first increase since 2007. 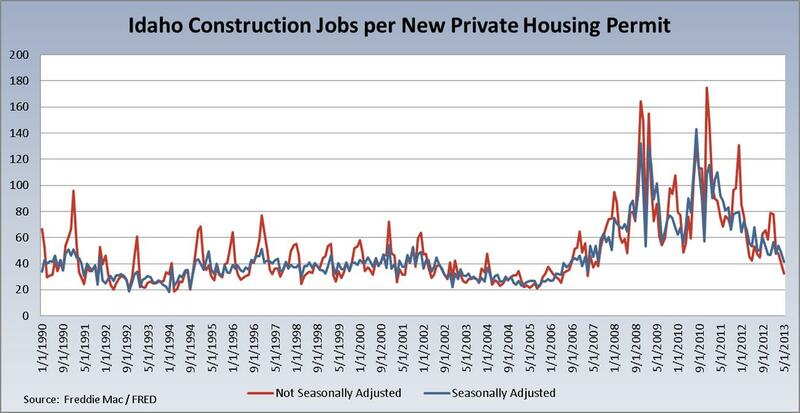 After an unremarkable 2003, Idaho’s construction employment started to boom in 2004. That year more than half of Idaho’s construction job growth was in excess of what national job trends generally or in construction would have indicated. More than 1,800 jobs were created above the 1,342 jobs that national trends would explain. In 2005 national trends would have added 2,034 jobs in Idaho’s construction industry. But Idaho actually added 3,250, and the gap would only increase. National trends would explain 2,067 new jobs in 2006 but Idaho added 6,961. Seventy percent of the total increase was unique to Idaho. employment changes in three ways. First, jobs are added or subtracted based on general economic conditions and the job change nationally. Second, nationwide industry specific trends are taken into account. Third, the change that is left over is considered unique to an industry within a defined region and not explainable by national trends. 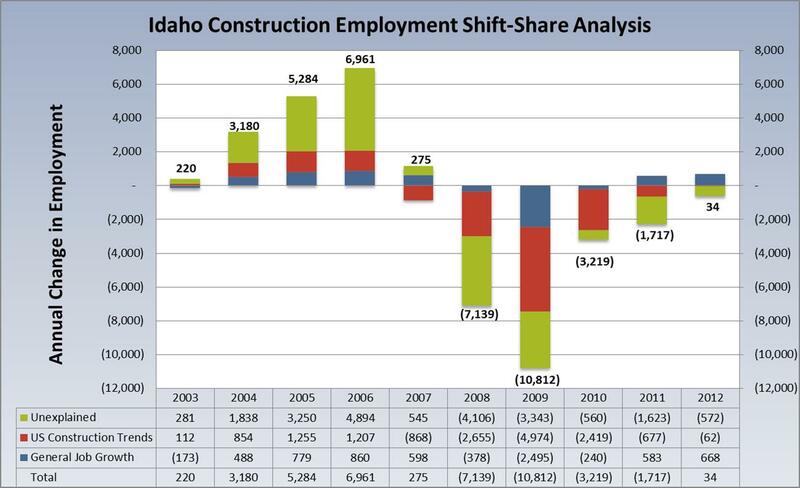 The recession’s corrective measures were applied liberally to Idaho’s construction employment between 2008 and 2012. Excess jobs that were added during the housing bubble were shed in dramatic fashion. Between 2008 and 2012 national trends would have decreased Idaho’s construction employment by more than 12,600. Idaho lost not only those jobs but another 10,200 in construction, nearly erasing the 10,800 jobs generated between 2003 and 2007 in excess of national trends. Five years of excessive growth was essentially reversed by five years of excessive decay. The issue now is whether the decline is over. variance between highs and lows remained relatively narrow. The jobs-to-permit ratio began climbing in 2006. The average ratio between 2007 and 2012 was more than double the previous 17 year average – 77 workers per permit compared to the prerecession 37.
remains drastically different – interest rates. The average 30-year mortgage rate between 1990 and 2006 was 7.5 percent. From January 2008 to June 2013 the average was 4.7 percent. Even with the lowest interest rates on record, the worker-to-permit ratio continues to fall. And interest rates have nowhere to go but up. The Federal Reserve Bank continues to promise a “highly accommodative” monetary policy, keeping the federal funds rate between zero and one-quarter percent until national unemployment falls below 6.5 percent. It was at 7.6 percent in June. If the worker-to-permit ratio continues to fall and mortgage rates begin to rise, construction hiring will likely remain soft for some time to come. After the 1990 and 2001 recession the jobs-to-permit ratio dipped into the 20s. Idaho current ratio is almost twice as high as those historical figures. This entry was posted in Employment News and tagged Idaho construction jobs, idaho department of labor, idaho economy on August 7, 2013 by Idaho Department of Labor.